If Long Beach had surf, would more people visit? The obvious answer to this question is yes. The more challenging question is how many people would come to surf. 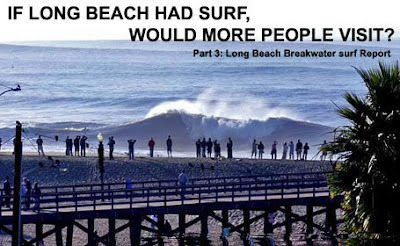 Predicting how many people would come to visit Long Beach to surf would likely depend on the quality of the surf and how often the surf was good. The Long Beach Chapter of the Surfrider Foundation has a long running campaign to "Sink the Breakwater and Restore the Shore"
As part of their campaign they convinced the City of Long Beach to do a feasibility study of the breakwater removal. Part of that study was an economic analysis of the benefits to tourism resulting from improved water quality, beach conditions & surfing. To better understand how the surfing would improve and how many surfers might visit, the Chapter contracted with Sean Collins at Surfline (a leading surf forecasting site) to use their models, historical surf records and expertise to predict how many days of surf Long Beach would see, how many good days and how many poor days and then estimated how many surfers would show up to surf it. You can read this very interesting report here. So what's the conclusion? Based on this approach, Collins estimates that restoring surf to Long Beach could result in over 394,000 annual visits. This visitation estimate is being fed into an economic analysis that should be available in mid-July. We'll report on that when its available. 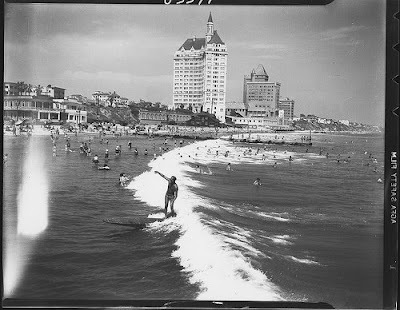 Duke Kahanamoku surfing in Long Beach before the breakwater was installed.